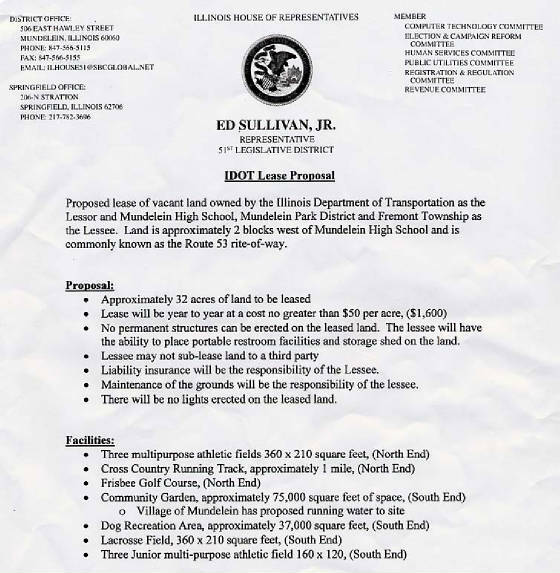 The issue in question is the proposal below from Rep. Ed Sullivan Jr. Most of the residents that I have spoken to and who live on property that backs up to the land in question, are strongly against this propsal. They have signed a petition to prohibit the use of this land for anything other than the beautiful field that it is currently. On the following pages you will find the original proposal, letters written by local residents, maps of the proposed use of the land, information about the parties involved with the lease, updates from the outcome of board meetings, and many other documents opposing this proposal. Please use our links page to contact Board members directly to voice your opinion and our forms page to electronically sign the letter addressed to the various boards. We are currently looking for volunteers to attend and speak at board meetings (posted on our calendar page) and to go door to door looking for supporters.